On those first crisp fall days, when the last raspberries have just been picked, I like to curl up with a slice of chocolate cake. 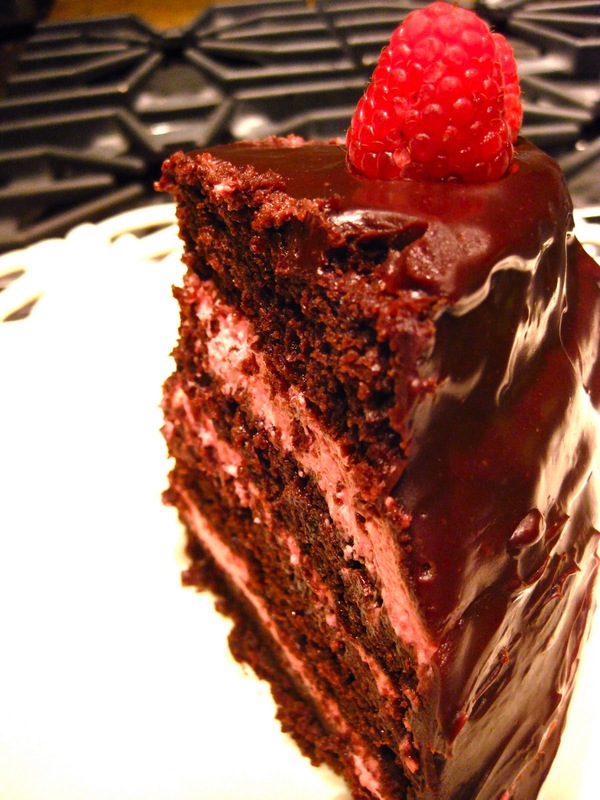 Specifically, I like to curl up with four layers of rich chocolate raspberry mousse cake. Drizzled with tangy raspberry syrup. Sandwiched between fresh raspberry mousse. Covered in chocolate ganache, and, finally, garnished with raspberries. Phew! What a delicious way to say goodbye to summer! Don't worry, I didn't eat all of this cake myself (cue imagery from Roald Dahl's Matilda) - I had the help of some lucky friends. Remaining slice of chocolate raspberry mousse cake recipe. So lucky, in fact, that they got first dibs ... and this was the last morsel I could whisk off for a photo shoot before the whole thing was gone! You can even see a few battle scars on the cake from this frightening maneuver. Sorry I didn't get a nicer slice to photograph; there are only so many limbs I will stick into a pack of feeding hyenas. Besides, I think you get the idea. One note: To get four layers, I baked two cake rounds and split each in half, but when serving the cake, I struggled to slice through all four layers without causing the cake to shift. Instead, I'd suggest a single layer of mousse between two layers (depending on the cake-to-mousse ratio you want, either keep the original two cake rounds intact, or make a single cake round and cut it in half). I've adjusted everything below for a two-layer cake with one layer of mousse. If you really want to try a four-layer version, just double the mousse recipe, and split the two cake layers in half. I don't have anything against box mixes. By all means, give yourself a break after going through the pain of making raspberry mousse (honestly, you'll have earned it). However, if you want to try a delicious from-scratch chocolate cake recipe, then you can kick it up a notch with one of my favorites, found on Epicurious. Yeild: two 10-inch by 2 inch cake rounds. Let them cool, and then if the tops are crowned, level them with a bread knife before proceeding. Chocolate ganache is simple to make, and there are plenty of variations online. The one that Epicurious provides in the chocolate cake recipe above works just fine. Go for it! This is labor intensive...mainly because you have to seed the raspberries if you don't want seeds in your mousse. As an alternative, you can try to substitute seedless raspberry jam, but you will end up losing the freshness and intense flavor of the real fruit. Purée the fresh and frozen raspberries with 1/6 cup of the the reserved raspberry liquid. Strain through a fine sieve, pressing firmly, to separate the pulp from the seeds as thoroughly as possible. Stir 1/2 cup powdered sugar into raspberry pulp and set aside, ideally in a metal bowl (important later, for heat transfer). In an electric mixer, beat the whipping cream just until it holds soft peaks. Set aside. Place the 3 Tbsp of seedless raspberry jam and remaining 1/6 cup of raspberry liquid (use water instead if you didn't get enough liquid from the thawed berries) in a small microwaveable dish. Heat in brief intervals, stirring, until jam is melted. Add gelatin and stir. Heat gently again, stirring until gelatin is melted. Whisk this into the raspberry pulp. Place the bowl of raspberry pulp mixture in a larger bowl of ice and water, whisking until slightly thickened. Remove from ice water, and whisk in 1/4 of the whipped cream. Carefully fold in remaining the whipped cream until just combined and no streaks of the two mixtures are left. Taste a small spoonful of mousse. If it is still too tart, carefully fold in more powdered sugar in small increments (1/4 cup or less) until it's sweet enough for you. At this point, you can also add food coloring to achieve the desired "raspberry color" if needed. Allow to cool in refrigerator ~30-45 min, or until it begins to stabilize. This gives the gelatin time to set, so that your filling can withstand the weight of a cake layer without oozing out the sides of the cake. Add 1/2 cup sugar to 1/2 cup raspberry juice, and boil on stove top until sugar is dissolved. Once sugar is dissolved, reduce heat and carefully add jam, stirring just until dissolved. Add remaining 1/2 cup uncooked raspberry juice (Note: I think that adding the last 1/2 cup of raspberry juice at the end, rather than cooking it with the sugar, helps preserve some of the fresh raspberry flavor, as some flavor compounds are destroyed by heat). Let the cake layers cool. If they came out crowned, remove a thin slice off the top to level them (cut through carefully using cake leveler, large kitchen knife, or my preferred method: dental floss). Leveling the cakes also helps them absorb the raspberry syrup by exposing the inner crumb. Put first layer on your cake plate. Drizzle evenly with up to 1/3 cup raspberry syrup. Spread with raspberry mousse (1/2 inch to 1 inch layer) that has already cooled in refrigerator for about 30 min. Put the cake assembly in fridge for another 30 min or longer to let the mousse stabilize more before placing second cake layer on top. Add the second cake layer and drizzle it with 1/4 to 1/3 cup raspberry syrup. Pour and spread the chocolate ganache across the top and sides of the cake. Garnish top with 19 fresh raspberries (16 raspberries around edge, three in middle). And, you're done! Yum! I hope you like this raspberry mousse chocolate cake!